Answers to commonly asked questions about our oil delivery service. If you don't see the answer you are looking for, try our live chat! Our response is quite simple, why are competitor prices so high? We all get our heating oil from the same terminal, so why do some companies charge such a high rate for delivery? Often competitors will try and imply we use lesser quality oil. These are simply smear tactics on their part to distract from their ridiculously high prices. Don't be fooled into paying more money for the same product! You can place your order right through our website, or you can call our office at 203-208-4917. Existing customers can also text their order to 203-208-4917. Most deliveries can be made within 2-3 business days, often sooner. During the Spring/Summer/Fall we deliver home heating oil Monday through Friday. We do our best to deliver as soon as possible, but cannot guarantee delivery dates and/or times. We accept all major credit/debit cards, as well as cash. Our price for credit/debit is the same as cash, so it is usually the most convenient option for customers. There is no reason for a company to charge extra for using a card, it is part of the cost of doing business. As long as we can access the fill pipe, you do not have to be home. A receipt will be left on site for you. We can also email a receipt as well. Do you offer automatic deliveries? Yes, we offer automatic delivery. Visit the following link to learn more. We do not offer emergency service. Diesel fuel can be added to get you through until we deliver your heating oil. During the colder months, 5-7 gallons per day should cover most homes. The minimum order is 50 gallons. To save you money, it is best to order at least 100 gallons. If you really want to save, order 300 or more gallons, as the price is even better! What happens if I take less than 50 gallons? If we arrive to deliver fuel, and for reasons not attributable to us, we deliver less than 50 gallons, there will be a $50 delivery fee added on to the amount of oil ordered. For example, you order 100 gallons from our company and another company fills your tank before we get there and our delivery is only 15 gallons. In this case you would be charged for the 15 gallons at our current 50 gallon rate and a $50 delivery fee would be added to the bill. If we are unable to deliver fuel, at no fault of ours, there will be a $75 trip fee for us coming to your residence/business. This is non-negotiable. All orders canceled the same day as delivery will be subject to a $75 cancellation fee. Orders canceled at least 1 business day prior are charged a $10 cancellation fee. This covers our time and costs associated with processing your credit/debit card. Delivery to Branford, East Haven & North Branford is every day, Monday thru Saturday. Delivery to Bethany, Cheshire, Durham, Hamden, Meriden, Middlefield, Middletown, New Haven, North Branford, North Haven, Northford, Orange, Prospect, Wallingford, West Haven & Woodbridge is Tuesday, Thursday & Saturday. Delivery to Centerbrook, Chester, Clinton, Deep River, East Lyme, Essex, Guilford, Haddam, Ivoryton, Killingworth, Lyme, Madison, New London, Niantic, Old Lyme, Old Saybrook, Waterford & Westbrook is Monday, Wednesday & Friday. Can I schedule a delivery for a later date? When your order is placed, your delivery will be scheduled for the next available service day for your area. Due to varying market prices for home heating oil, we cannot hold prices for future deliveries. PurpleFuels does not give times for deliveries. In order to keep our prices so low, we have to be able to run our delivery routes as efficiently as possible. We can guarantee a delivery day, just not a time. For most customers, this won't be an issue, as you do not have to be home for the oil delivery. Have Billing or Service Questions? 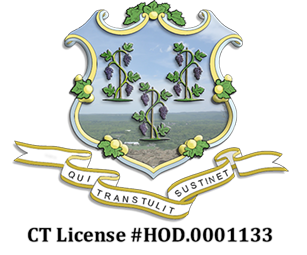 Email us for questions concerning delivery of home heating oil in the Connecticut Shoreline area. Every day, Monday through Saturday: Branford, East Haven & North Branford. Mon/Wed/Friday: Centerbrook, Chester, Clinton, Deep River, East Lyme, Essex, Guilford, Haddam, Ivoryton, Killingworth, Lyme, Madison, New London, Niantic, Old Lyme, Old Saybrook, Waterford & Westbrook. 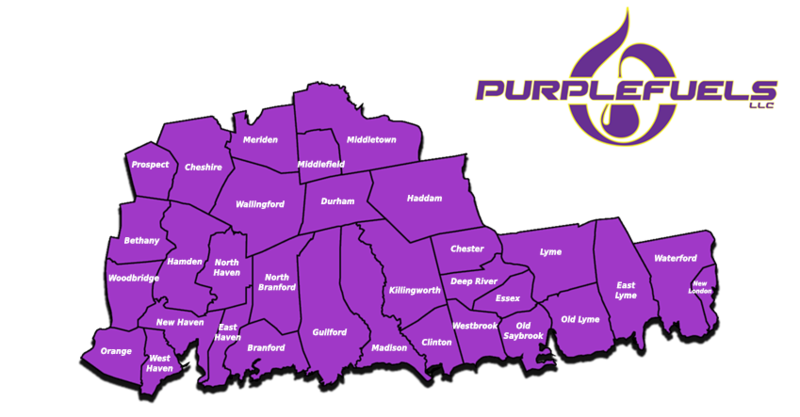 Tue/Thu/Sat: Bethany, Cheshire, Durham, Hamden, Meriden, Middlefield, Middletown, New Haven, North Haven, Northford, Orange, Prospect, Wallingford, West Haven & Woodbridge.